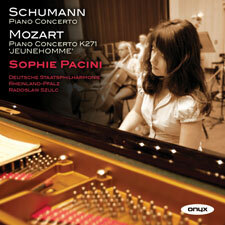 Winner of the 2011 Prix Groupe Edmond de Rothschild of the Sommets Musicaux de Gstaad, Sophie Pacini makes her CD debut with Schumann’s Piano Concerto, and Mozart’s first great piano concerto, No.9 K271. ‘You really are very good, do you know that?’ said Martha Argerich after hearing her play the Liszt Sonata. Argerich paved Sophie’s way to Fou T’song and invited her to take part in the Progetto Martha Argerich in Lugano. They arrange to meet whenever possible, and worked together in preparation for this recording.